Most newer cars require little or no added lubrications for the suspension, steering linkage or drive train. Most older cars require this as a maintenance item. This is accomplished by using a grease gun. Most grease guns are hand held metal pump-like devices that a tube of grease is inserted into, then a handle is "pumped" to force the grease out through a hose or nozzle. On the car there are fittings called "grease zerks" Here is what they look like. Most cars will have grease zerks at several points on the front suspension pieces, on the steering linkage and on the drive shaft universal joints. Your owners or shop manual may have a diagram off all of these points. After locating the grease zerks, it is important to wipe them off to avoid forcing any dirt into the joint. In order to grease the area, you place the end of the grease gun firmly on the grease zerk and pump the handle till you see grease ooze out. This ensures there is fresh grease in the joint. On classic cars I would suggest doing this at lease once a year, maybe more on a daily driver. Again consult your owners or shop manual for suggested maintenance schedule. You're right, stanchfi: it's vital to clean the grease point thoroughly before applying the end of the gun. Failure to do this will force dirt into the joint, which would rather defeat the object! The gun's coupling needs some firm pressure to push on to the grease point, but once on should grip strongly; you shouldn't need to hold it in place as you pump the gun. The pressure is several thousand psi, so some leakage might occur, but most of the grease should go in. If it doesn't, either the coupling or grease point is worn. The answer's obvious. Strictly speaking, you should keep pumping after the old (black) grease starts to be forced out of the joint, and until new (golden) grease appears. Realistically, I don't know anyone who would do this! But it is important that you wipe off the excess grease when you've finished; dirt will stick to it if you don't. The frequency of greasing is both time and mileage based, say once a month or 1,000 miles. This was the recommendation for the 100E; I'd suggest that three months / 3,000 mile periods are adequate. Grease does harden over time, hence that part of the schedule. Provided this is done regularly, these joints can last an incredibly long time. It also might be good to mention, since the excess grease rarely gets wiped off, you may have to hunt for the grease zerks, digging away years of old grease and dirt. I think I have mentioned this before, but since we are on Grease Guns, it is worth repeating. A secondary but valuable use for the grease gun is un-sticking frozen wheel cylinder pistons and calipers. I generally remove the seized components from the vehicle rather than attempt to use the hydraulic master cylinder as a pressure device. I unscrew the zerk fitting adapter from the end of the grease gun output tube and apply my own adapter than will screw directly into the input port of the seized hydraulic component. The second hydraulic port has to be blocked with a bleeder screw or threaded cap. This will now be a solid 1:1 connection between the grease gun and the component, allowing no grease the opportunity to escape. 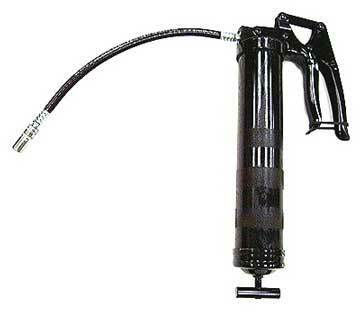 The grease gun is then pumped until the seized piston is pushed out of the cylinder or caliper. So far, I have not encountered any stubborn hydraulics that would not succumb to this method. The final step is cleanup of the applied grease. I place the unassembled parts in a solvent-wash sink or use degreaser for cleanup, making sure all traces of grease are removed to prevent future hydraulic contamination and allow for examination and refurbishing of the hydraulic pistons and cylinder bores.